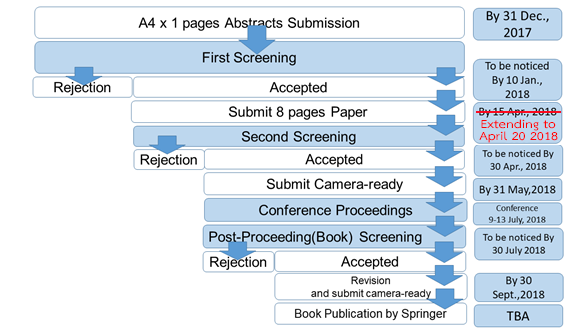 Note: Any submissions Rejected by screening can shift to Poster following advices of reviewers. * Items 3 & 4 Student ID card is needed. ** ISAGA 2018 applicants who participated in ISAGA 2017, SimCongress 2017, JASAG 2017 Spring, JASAG 2017 Autumn or NASAGA 2017, ABSEL2018 conferences can enjoy a 5% discount from all fees listed above. In this case, they must present a copy of certificate of attendance and fee receipts of those conferences at the ISAGA2018 conference counter. The discount will then be paid to the applicant in cash in Nakorn Pathom, Thailand. Please complete the form here to let us know of your travel and other plans for ISAGA2018, so that we can make adequate preparations for your arrival and stay during the period.